The United States expressed anger on Wednesday (July 19) after a Turkish news agency published a map detailing US-run military outposts in northern Syria. Anadolu Agency published an infographic on Tuesday showing 10 locations in which US troops were stationed. Two airbases, eight military points in PKK/PYD-controlled areas. US Special Forces located in military points in Hasakah, Raqqa and Manbij. The 8 military sites, according to the agency, host military personnel involved in coordinating the aerial and artillery bombardments of US forces, training Kurdish military personnel, planning special operations and participating in intensive combat operations. "The release of sensitive military information exposes Coalition forces to unnecessary risk and has the potential to disrupt ongoing operations to defeat ISIS," Reuters quoted Pentagon spokesman Eric Pahon as saying. "While we cannot independently verify the sources that contributed to this story, we would be very concerned if officials from a NATO ally would purposefully endanger our forces by releasing sensitive information," Pahon said. He added that the United States has voiced its concerns to Turkey. According to Anadolu Agency, the United States established two air bases, one in the Rumeilan area in Hasakah province, northeast Syria, in October 2015, while the second one in Kharab A’sheq town, southwest of Ayn al-Arab (Kobani) city in Aleppo province, north of the country. US forces also use residential units, Syria Democratic Forces (SDF) camps and mobile factories as command centers. In its report, the agency pointed out that US forces, in order to ensure the security of these military posts, declare their surroundings so-called "prohibited lands". The agency pointed out that four US military sites were established in the Hasakah province with the latest one established in the northern district of Tal Baydar and is currently hosting around 100 US soldiers. The second site was established in Ash Shaddadi area, south of Hasakah, and hosts about 150 fighters from the US Special Forces to support the operations of the YPG-dominated Kurdish SDF militia. The third site is located in the Tal Tamir agricultural area on the Syrian-Turkish border, however, the number of US soldiers it hosts is unverifiable. AA also reported the presence of an US military post in the territory of Raqqa province. The military site is located in the town of Ayn Issah within the Tell Abyad district in Raqqa, which is controlled by PKK-affiliated SDF militants and employs about 200 US soldiers and 75 French troops, according to the Turkish government agency. The United States established four military sites in Aleppo province, as shown in AA’s infographic. The United States established two operational command centres in Manbij city in 2016 after the area was seized by the PKK-affiliated Kurdish militia. The first site is located in Ayn Dadad town near Manbij which the Turkish agency believes that the military site may be used by US Special Forces to monitor the movements of the Turkey-backed opposition groups affiliated with the Free Syrian Army (FSA). While the second command center is located in Ushariya town and is used by the US to ensure the security of the Kurdish militants against the Free Syrian Army. Another post lies in the south of Ayn al-Arab and hosts US Special Forces in addition to fighters from its French counterpart. US forces also set up a large military post in the city of Srin northwest of Ayn al-Arab in Aleppo and is used to receive military cargo planes. AA pointed out that this site carries out the supply of arms and military equipment to the Kurdish militants. US forces also use the site as a liaison center between the US-led International Coalition forces against ISIS and to disrupt communications between ISIS militants. Turkey, an US ally since the Cold War and a member of NATO, has been at odds with the United States for months as Washington has continued to lean on, and more recently arm, Kurdish fighters. 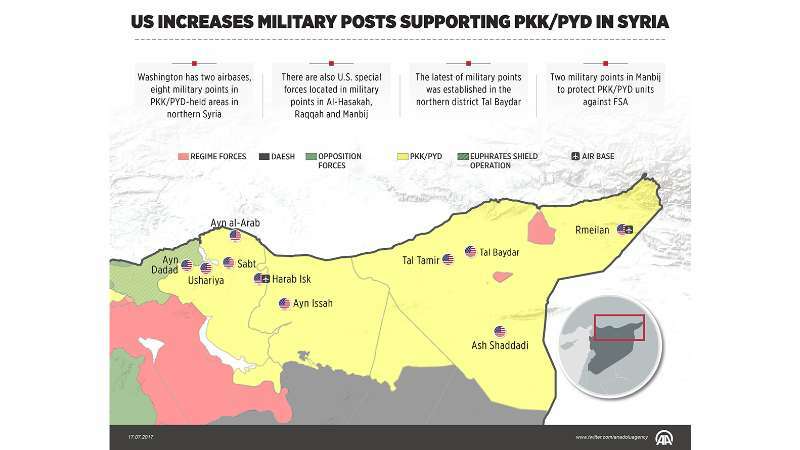 The Pentagon sees the Kurds as an integral partner in Syria, while Turkey views the YPG as an extension of the PKK, a US-recognized terrorist group that has waged an insurgency against Ankara for years. Levent Tok, an Anadolu Agency reporter who worked on the story, told Bloomberg News that the information had been compiled by field work and social media images, Washington Post reported. The last official count by the Pentagon put the number at around 500, but other sources suggest the number is closer to 1,500. U.S. troops are in the country, the US news outlet reported.